Eighteen more people have been sickened by the E. coli outbreak tied to chopped romaine lettuce from the Yuma, Arizona, growing region, health officials report. According to the latest update from the Centers of Disease Control and Prevention (CDC), 53 people have now been affected in 16 states. In total, 31 out of 48 people with available information have been hospitalized -- a rate of 65 percent -- including five people who have developed a type of kidney failure called hemolytic uremic syndrome (HUS). "This is a higher hospitalization rate than usual for E. coli O157:H7 infections, which is normally around 30 percent," the CDC said in a statement. "Health officials are working to determine why this strain is causing a higher percentage of hospitalizations." No deaths have been reported. Health officials say information collected to date indicates that chopped romaine lettuce from the Yuma growing region could be contaminated with E. coli O157:H7. No common grower, supplier, or distributor has been identified yet. 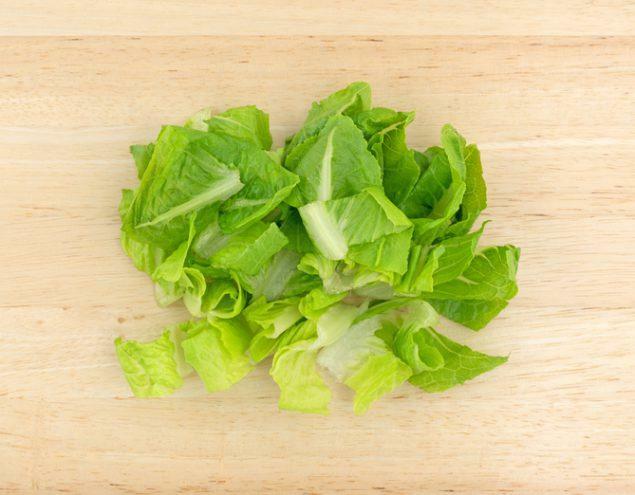 To keep yourself and your family safe, the CDC recommends avoiding any romaine lettuce products that could be contaminated. "Consumers anywhere in the United States who have store-bought chopped romaine lettuce at home, including salads and salad mixes containing chopped romaine lettuce, should not eat it and should throw it away, even if some of it was eaten and no one has gotten sick. If you do not know if the lettuce is romaine, do not eat it and throw it away," the CDC states. Before buying romaine lettuce at a grocery store or eating it at a restaurant, officials urge consumers to confirm with the store or restaurant that it is not chopped romaine lettuce from the Yuma, Arizona growing region. If this cannot be confirmed, do not buy it or eat it. Restaurants and retailers are also being urged not to serve or sell chopped romaine lettuce from the Yuma growing region and to check with suppliers about the source of their chopped lettuce. Symptoms of an E. coli infection include diarrhea, which can be bloody, severe stomach cramps and vomiting. Typically, it takes an average of three to four days to after eating contaminated food for symptoms to show. While the illness usually clears up within a week, sometimes it can linger longer and lead to serious complications. Signs of hemolytic uremic syndrome (HUS) include fever, abdominal pain, pale skin tone, fatigue and irritability, unexplained bruises or bleeding from the nose and mouth, and decreased urination. These complications are more common in young children under 5, older adults, and people with weakened immune systems.